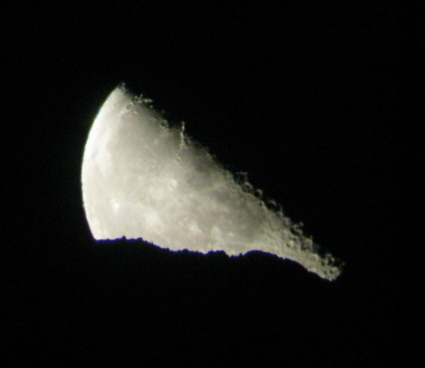 (DEC 28) Got a telescope for Christmas? A giant storm even brighter than Saturn's rings is raging through the planet's cloudtops. "I've never seen anything like this," says veteran planetary photographer Anthony Wesley. "It's possible that this is the biggest storm on Saturn in many decades." "At it's current size and brightness, the storm should be visible to anyone with a mid-size scope under steady seeing," continues Wesley. 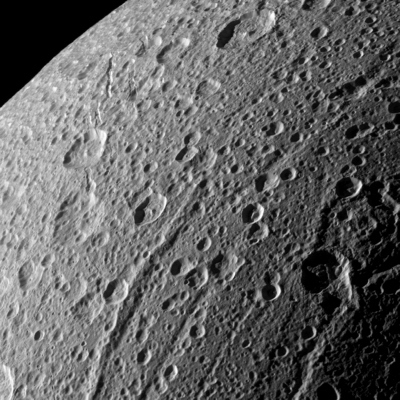 "This is a great time to be a planetary photographer." (DEC 15) VANDENBERG AFB, Calif.--The Missile Defense Agency was unable to achieve a planned intercept of a ballistic missile target during a test over the Pacific Ocean today. The flight test included the successful flight of an intermediate-range ballistic missile target from Ronald Reagan Test Site on Kwajalein Atoll in the Republic of the Marshall Islands and a long-Range interceptor missile launched from Vandenberg Air Force Base, Calif. The Sea Based X-Band radar (SBX) and all sensors performed as planned. The Ground Based Interceptor (GBI) was launched and successfully deployed an Exoatmospheric Kill Vehicle (EKV). Program officials will conduct an extensive investigation to determine the cause of the failure to intercept the target. The next flight test will be determined after identification of the cause of the failure. (DEC 14) VANDENBERG AIR FORCE BASE, Calif. - Today's scheduled Missile Defense Agency ground-based interceptor flight test has been delayed due to poor weather conditions downrange. The flight test has been rescheduled for Wednesday, Dec. 15, with a launch window from 8 a.m. to noon. The ground-based interceptor test will defend against an intermediate-range ballistic missile target launched from Kwajalein Atoll, Marshall Islands. The operationally-configured interceptor is designed to intercept and destroy a ballistic missile warhead as part of the Ground-based Midcourse Defense element of the integrated Ballistic Missile Defense System. This will be the fourth launch of an operationally configured ground-based interceptor from Vandenberg AFB. (DEC 10) VANDENBERG AIR FORCE BASE, Calif. - The Missile Defense Agency plans to conduct a flight test involving the launch of a ground-based interceptor from the Ronald W. Reagan Missile Defense Site here Dec. 14 with a launch window of 8 a.m. to noon. (DEC 3) VANDENBERG AIR FORCE BASE, Calif. - The U.S. Air Force's first unmanned re-entry spacecraft landed at Vandenberg Air Force Base at 1:16 a.m. PST today. (NOV 30) VANDENBERG AIR FORCE BASE, Calif.-Preparations for the first landing of the X-37B are underway at Vandenberg Air Force Base. Space professionals from the 30th Space Wing will monitor the de-orbit and landing of the Air Force's first X-37B, called the Orbital Test Vehicle 1 (OTV-1). 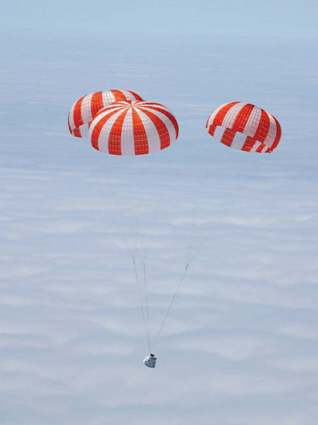 While the exact landing date and time will depend on technical and weather considerations, it is expected to occur between Friday, December 3, and Monday, December 6, 2010. (NOV 22) Hawthorne, CA - Since the Federal Aviation Administration (FAA) Office of Commercial Space Transportation was created in 1984, it has issued licenses for more than 200 launches. Today the FAA has made SpaceX the first-ever commercial company to receive a license to re-enter a spacecraft from orbit. Next month, SpaceX is planning to launch its Dragon spacecraft into low-Earth orbit atop a Falcon 9 rocket. 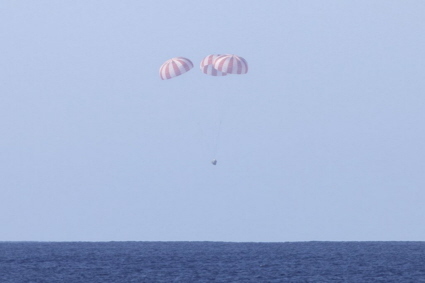 The Dragon capsule is expected to orbit the Earth at speeds greater than 17,000 miles per hour, reenter the Earth's atmosphere, and land in the Pacific Ocean a few hours later. This will be the first attempt by a commercial company to recover a spacecraft reentering from low-Earth orbit. It is a feat performed by only 6 nations or governmental agencies: the United States, Russia, China, Japan, India, and the European Space Agency. It is also the first flight under NASA's Commercial Orbital Transportation Services program to develop commercial supply services to the International Space Station and encourage the growth of the commercial space industry. After the Space Shuttle retires, SpaceX will make at least 12 flights to carry cargo to and from the International Space Station as part of a Commercial Resupply Services contract for NASA. The Falcon 9 rocket and Dragon spacecraft were designed to one day carry astronauts; both the COTS and CRS missions will yield valuable flight experience towards this goal. The license is valid for 1 year from the date of issue. A Delta II rocket carrying Italy's COSMO-4 Earth imaging satellite arcs across the sky following liftoff from Vandenberg AFB on the evening of November 5. 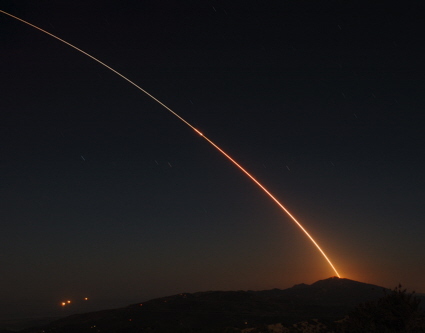 The Webmaster recorded the first few minutes of the launch from the mountains north of Santa Barbara using a Nikon D70 digital camera set up to make a time exposure. Copyright 2010 Brian Webb. All rights reserved. (NOV 5) VANDENBERG AIR FORCE BASE, Calif.-Vandenberg launched a Delta II rocket carrying the Thales Alenia Space-Italia COSMO-SkyMed Satellite, Friday, Nov. 5, at 7:20 p.m. from Space Launch Complex-2 on North Vandenberg. This launch is the fourth and final for COSMO-SkyMed. "This was a critical launch for completing the COSMO-SkyMed constellation and Team Vandenberg performed brilliantly," said Col. Richard Boltz, 30th Space Wing commander. 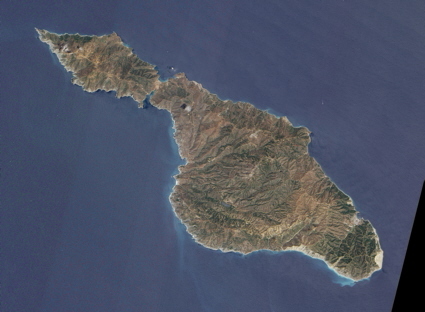 The overall objective of the COSMO-SkyMed program is global Earth observation, particularly in the Mediterranean area. Some applications include territorial surveillance; analyzing effects of natural disasters; coastal surveillance to assess erosion and sea/river pollution, monitoring of farming, forestry resources and urban buildings; mapping with a resolution on the order of one meter; and territorial security and strategic defense. The three other COSMO-SkyMed satellites were launched from Vandenberg in June 2007, December 2007 and October 2008. (SEP 28) Vandenberg AFB, Calif. - The launch of Delta II COSMO-SkyMed 4 (Constellation of Small Satellites for Mediterranean basin Observation) mission has been rescheduled for Sunday, Oct. 31 with a launch time of 7:20 p.m. PDT. Previously, the launch was scheduled for Friday, Oct. 29. During final preparations Wednesday to ready the Delta II rocket for flight, a sample from the propellant to be loaded into the Delta II to power it during flight failed to meet established standards. To allow engineers the additional time required to correct this issue, the scheduled Friday launch attempt was delayed 48 hours. Updates to the COSMO SkyMed-4 mission status will be issued as new information becomes available. United Launch Alliance provides the Delta II launch vehicle and mission services under a commercial launch service contract administered by Boeing Launch Services for Thales Alenia Space-Italia (TAS-I). (OCT 5) SANTA BARBARA, CALIF. - Jupiter's fiery moon Io will cast its shadow onto Jupiter during a free, public viewing Friday, Oct. 15, with Westmont's powerful Keck Telescope at the observatory near the soccer and baseball fields. People generally begin lining up for the first glimpse through the 24-inch reflector telescope after sunset, around 7 p.m. However, the shadow transit of Io will only be visible from 8:30-10:30 p.m.
Tom Whittemore, Westmont physics instructor, says the moon will dominate the southern sky since it will be gibbous ((bulging outward) at nine-days old in the constellation Capricorn. "The spotlight will be on the wonderful crater triplet of Ptolemaeus, Alphonsus and Arzachel," Whittemore says. "They will be near the terminator and should look dazzling." A variety of open clusters will also be observable in the northeastern sky with the rising winter Milky Way in Cassiopeia and Perseus. Westmont serves as one of the public observing sites for the Santa Barbara Astronomical Unit (SBAU) every third Friday of the month. Members of the SBAU also bring their telescopes to the public viewing, which lasts for several hours. Free parking is available near the baseball field. A Minotaur IV rocket carrying the SBSS satellite blazes a trail across the sky on following liftoff from Vandenberg AFB on the evening Saturday 25. The Webmaster recorded the event in this time exposure taken from the mountains north of Santa Barbara, Calif. 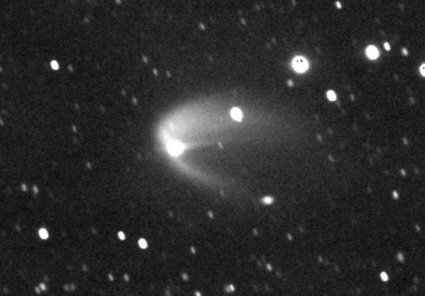 The bright knot in the trail is Minotaur stage 1/2 separation. 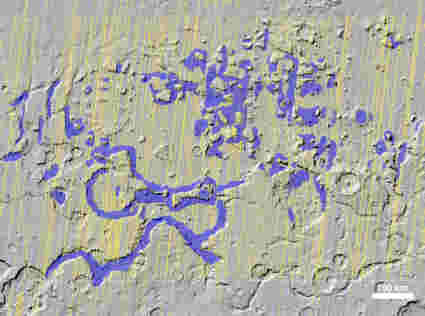 The short streaks are star trails caused by the Earth's Copyright 2010 Brian Webb. All rights reserved. (SEP 25) VANDENBERG AIR FORCE BASE, Calif. - Team Vandenberg launched a Minotaur IV rocket at 9:41 p.m. Sept. 25 from Space Launch Complex-8 here. The Minotaur IV launched the Space-Based Space Surveillance satellite, a first-of-its-kind satellite that can detect and track orbiting space objects from space. The 30th Space Wing commander, Col. Richard Boltz, was the launch decision authority. "SBSS will greatly enhance our existing space situational awareness capability, a capability vital to protecting our space-based assets," said Colonel Boltz. "This evening's launch was our third launch in eight days, and I am extremely proud of Team Vandenberg for all the hard work and dedication they've put into these important missions." This launch was a combined effort among the 30th Space Wing, Orbital Sciences Corporation, The Boeing Company, Ball Aerospace and the Space and Missile Systems Center. The Minotaur IV launch vehicle provides the ability to deliver payloads up to 3000 kilograms on long range, suborbital trajectories. It utilizes residual Peacekeeper solid rocket motors combined with Orbital's commercial launch vehicle technologies. (SEP 21) VANDENBERG AIR FORCE BASE, Calif. -- Team Vandenberg launched an Atlas V rocket at 9:03 p.m. Sept. 20 from Space Launch Complex-3 here. The launch, the second of three the base has scheduled for September, was the result of a team effort between the 30th Space Wing, the United Launch Alliance and the National Reconnaissance Office. "This Atlas launch is the culmination of a tremendous amount of hard work on the part of all the men and women of the 30th Space Wing and our mission partners," said Col. Richard Boltz, 30th Space Wing commander. "We're all extremely proud of everyone's efforts." This evening's launch marked the 604th overall Atlas mission in U.S. history. The rocket carried a national security payload for the NRO. Team Vandenberg's next launch, a Minotaur IV carrying the first Space Based Space Surveillance satellite, is scheduled for Sept. 25 from Space Launch Complex-8 here. (SEP 17) VANDENBERG AIR FORCE BASE, Calif. - Team Vandenberg is scheduled to launch an Atlas V rocket from Space Launch Complex-3 Sept. 20 at 8:29 p.m. This launch marks the 604th overall Atlas mission in U.S. history. The launch is a team effort between the 4th Space Launch Squadron and the United Launch Alliance. "I'm incredibly proud of all the hard work of the men and women of the 4th Space Launch Squadron team in preparing for this Atlas V mission," said Lt. Col. Brady Hauboldt, 4th Space Launch Squadron commander. "We've worked side-by-side with United Launch Alliance and the entire 30th Space Wing to pull this campaign together over the last few months and we are now 'GO' for launch. We're all excited to have the opportunity to launch our newest Atlas V and demonstrate Team Vandenberg's continued contributions to space power." The rocket will carry a national security payload for the National Reconnaissance Office. (SEP 14) VANDENBERG AIR FORCE BASE, Calif. - The launch of an Air Force Global Strike Command unarmed operational test Minuteman III intercontinental ballistic missile has been rescheduled to launch from north Vandenberg Friday, Sept. 17, between 3 and 9 a.m. The missile's single unarmed re-entry vehicle is expected to travel approximately 5,300 miles, to a pre-determined target about 200 miles southwest of Guam. The launch has been rescheduled because of the need to ensure data collection equipment in the impact area is fully ready, according to officials. Neither the missile nor any missile launch mechanisms at Vandenberg are the cause of the delay, officials said. "As with all launches, stringent criteria must be met before we proceed with the test," said Colonel David Bliesner, 576th Flight Test Squadron commander. "It is important to be able to gather as much data as possible to properly assess the capability, operational effectiveness, readiness and accuracy of the ICBM missile force." The launch is one of a continuing series of pre-scheduled operational tests to ensure the weapon system's reliability and accuracy, officials said. (SEP 10) On Sept 1, 2010, the Missile Defense Agency executed the Flight Experiment Laser (FEL-01b) mission at the Point Mugu flight test range off the Southern California coast. The objective of this mission was for the Agency's Airborne Laser Test Bed (ALTB) to destroy a liquid-fuel, short-range ballistic missile during its boost phase. During the mission the Boeing 747 flying laser laboratory detected and tracked the target. However, the experiment terminated early when corrupted beam control software steered the high energy laser slightly off center. While we continue analyzing the failure, preliminary indications are that a communication software error within the system that controls the laser beam caused misalignment of the beam. 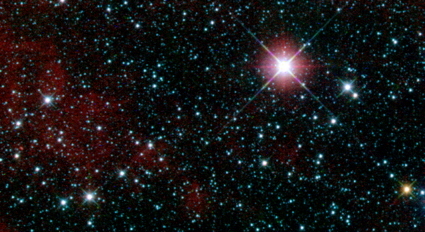 The ALTB safety system detected this shift and immediately shut down the high energy laser. The Agency plans to resume flight experiments beginning with tests of the software repair on September 13 leading to a lethal shootdown experiment involving a solid-fuel target missile by the end of this month. A mid-October experiment is in the planning stages that will involve lasing a solid-fuel missile at three times the range of last February's successful destruction of a liquid-fuel missile. (SEP 4) WASHINGTON -- NASA's Orbital Debris Program Office at Johnson Space Center reports that debris from the ICESat spacecraft fell to Earth over the Barents Sea on Monday, August 30, at approximately 5 a.m. EDT. ICESat, the first mission specifically designed to study Earth's polar regions with a space-based laser altimeter, was launched from Vandenberg AFB on 2003 January 12 aboard a Delta II rocket. Data from the spacecraft contributed to our understanding of ice sheet and sea ice dynamics. 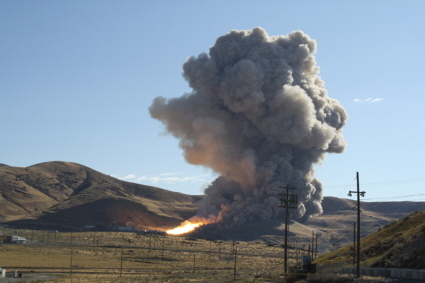 WASHINGTON -- NASA and Alliant Techsystems Inc. (ATK) will conduct a full-scale test of a five-segment, first-stage solid rocket motor at 11:05 a.m. EDT, Tuesday, Aug. 31. The test at the ATK Aerospace Systems test facility in Promontory, Utah will assess motor performance at low temperatures. NASA Television's live coverage of the test will begin at 11 a.m. and will broadcast a news conference at 12 p.m. with representatives from NASA and ATK. (AUG 12) LOS ANGELES AIR FORCE BASE, Calif. -- Air Force officials have completed their assessment and implemented necessary corrective actions associated with a Minotaur IV rocket software issue. That issue had prompted the Air Force to delay its previously scheduled July 8 launch of Space Based Space Surveillance. As the software effort came to a close, the government and industry team identified a potential mission risk associated with certain connectors used on flight avionics components aboard the Minotaur IV launch vehicle. Using NASA satellite data, scientists have produced a first-of-its kind map (click to enlarge) that details the height of the world's forests. 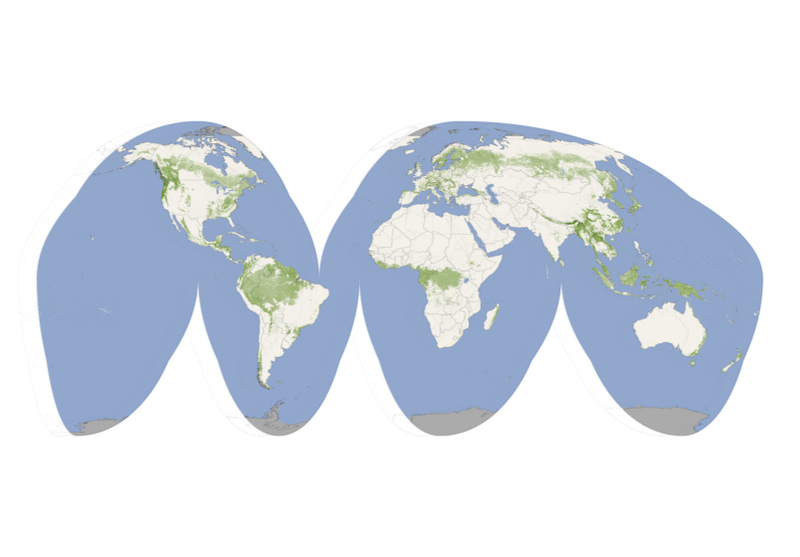 Although there are other local- and regional-scale forest canopy maps, the new map is the first that spans the entire globe based on one uniform method. The work is based on data collected by three satellites launched from Vandenberg AFB (ICESat, Terra, and Aqua ) and should help scientists inventory how much carbon is stored in the world's forests store and how fast that carbon cycles through ecosystems and back into the atmosphere. 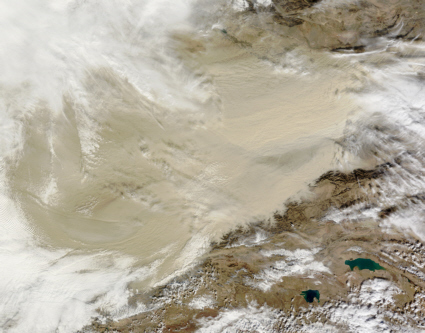 Image: NASA Earth Observatory/Image by Jesse Allen and Robert Simmon/Based on data from Michael Lefsky. (JUL 10) The July 8 launch of a Minotaur IV booster carrying the SBSS spacecraft from Vandenberg AFB has been delayed because of a software anomaly found during testing of another Minotaur IV at the factory. The software in question is used in both rockets. 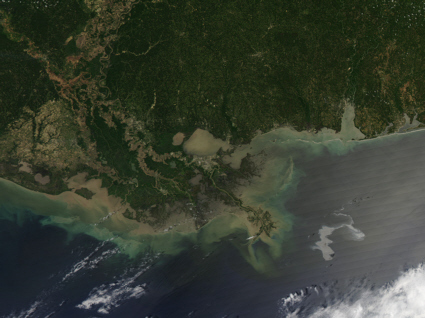 A new launch date will be set after an updated version of the software successfully finishes extensive testing. The testing could take as long as three weeks. (JUN 30) VANDENBERG AIR FORCE BASE, Calif. - A scheduled Minuteman III intercontinental ballistic missile test was launched at 3:40 a.m. June 30 from Launch Facility-04 here. The missile's single re-entry test vehicle traveled approximately 4,200 miles before reaching its pre-determined target near the Kwajalein Atoll in the Marshall Islands. ICBM analysts, including the Department of Defense and the Department of Energy, will use the data collected to ensure the readiness and capability of the ICBM fleet. "These launches teach us a great deal and require a team approach," said Col. Carl DeKemper, the 576th Flight Test Squadron commander and mission director. "The launch was part of our continuous self-assessment of the technical and weapons system expertise of our Airmen and the powerful capability of the ICBM fleet." According to Vandenberg historic records, today also marked the 1,900th launch for Vandenberg AFB since the Air Force assumed the mission in 1957. 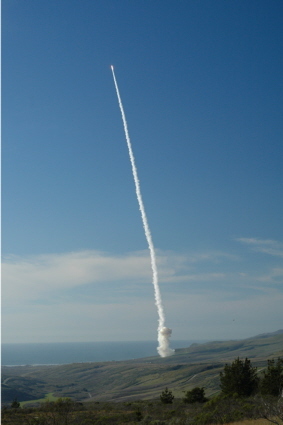 "This 1,900th launch marks another milestone in the history of Vandenberg and the contribution Vandenberg has had as not only contributing to the nation's security, but also a continuing player in our nuclear deterrence role and overall space and missile launch history of the United States," said Col. Steven Winters, the 30th Space Wing vice commander and the Launch Decision Authority for this mission. The launch was a combined effort of the 576th FLTS here, 341st Missile Wing, Malmstrom AFB, Mont., and the 30th Space Wing here. 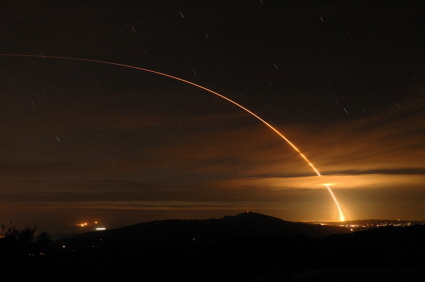 (JUN 16) VANDENBERG AIR FORCE BASE, Calif. - A scheduled Minuteman III intercontinental ballistic missile test was launched here at 3:01 a.m. June 16 from Launch Facility-10. The flight test was the first for the 576th Flight Test Squadron since its realignment under Air Force Global Strike Command. The missile's single re-entry test vehicle traveled approximately 4,190 miles before hitting its pre-determined target near the Kwajalein Atoll in the Marshall Islands. "Team Vandenberg's coordination was phenomenal resulting in a seamless launch operation," said Col. Steven Winters, the 30th Space Wing vice commander and Launch Decision Authority. MMIII missiles launched from Vandenberg carry sophisticated data collection equipment, according to Col. Carl DeKemper, the 576th FLTS commander. ICBM analysts, including the Department of Defense and the Department of Energy, will use the data collected from this mission for continuing force development evaluation. "For more than 50 years, Vandenberg has been at the forefront of testing and improving ICBMs to ensure the readiness and reliability of our fleet," said Col. DeKemper. "Our team is dedicated to ensuring a safe, secure and effective combat-ready ICBM force." NASA's Airborne Infrared Observatory Sees The "First Light"
(MAY 10) NASA's Jet Propulsion Laboratory, Pasadena, Calif., invites the public to a close-up look at JPL's past, present and future at its annual Open House on Saturday, May 15, and Sunday, May 16, from 9 a.m. to 5 p.m.
On special display will be the JPL-built Wide Field and Planetary Camera 2, retrieved from NASA's Hubble Space Telescope last year by space-walking astronauts. The instrument, affectionately known as the "Camera that Saved Hubble," is on loan from the Smithsonian Institution's National Air and Space Museum. 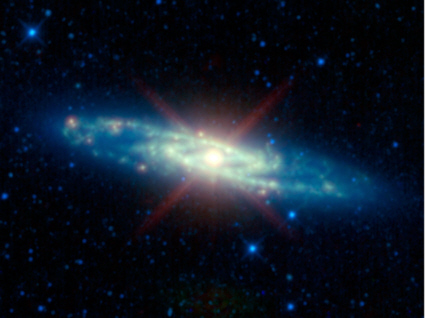 The camera captured many of Hubble's iconic space images. Other Open House highlights include: seeing JPL's next spacecraft bound for Mars, Mars Science Laboratory, under construction in the lab's largest "clean room;" life-size rover models in a "Mars" test bed; and JPL's Microdevices Lab, where engineers and scientists use tiny technology to revolutionize space exploration. Visitors can also see the sun through solar-safe telescopes, and learn how NASA instruments help scientists better understand global climate change. (MAY 4) SPACEPORT AMERICA, N.M. - UP Aerospace successfully launched a SpaceLoft XL rocket carrying several student experiments on a brief trip to the edge of space. The rocket lifted off from its desert launch site at 06:41 MDT and attained a maximum altitude of over 350,000 feet. The vehicle landed at White Sands Missile Range where the payloads were recovered in perfect condition. 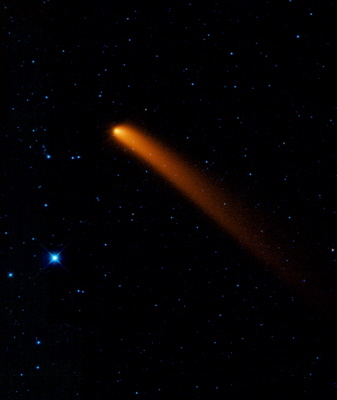 The launch was sponsored by New Mexico State University's Space Consortium. (APR 22) VANDENBERG AIR FORCE BASE, Calif. - Team Vandenberg launched the first Minotaur IV Lite launch vehicle at 4 p.m. April 22 from Space Launch Complex-8 here. The rocket launched the Defense Advanced Research Projects Agency's Falcon Hypersonic Technology Vehicle 2. The 30th Space Wing commander, Col. David Buck, was the launch decision authority. The Minotaur family of launch vehicles are provided via the Orbital/Suborbital Program 2 and managed by the U.S. Air Force Space and Missile Systems Center, Space Development and Test Wing's Launch Test Squadron located at Kirtland AFB, N.M.
(APR 21) VANDENBERG AIR FORCE BASE, Calif. - The launch of a Minotaur IV spacelift booster is delayed due to forecasted weather. The rocket was set to launch from Space Launch Complex-8 on south base Wednesday, April 21, 2010. The launch has been rescheduled with a time frame of noon-6 p.m. Thursday, April 22, 2010. (APR 19) VANDENBERG AIR FORCE BASE, Calif. - The launch of a Minotaur IV spacelift booster is delayed due to forecasted weather. The rocket was set to launch from Space Launch Complex-8 on south base Tuesday, April 20, 2010. 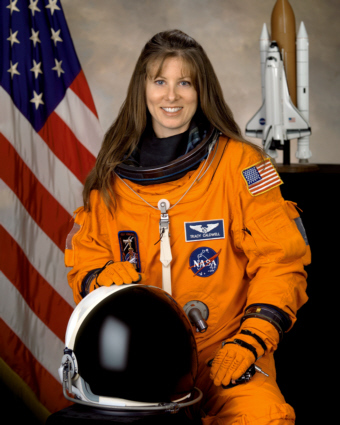 The launch has been rescheduled with a time frame of noon-6 p.m. Wednesday, April 21, 2010. (APR 16) VANDENBERG AIR FORCE BASE, Calif. - A Minotaur IV rocket is scheduled to launch from Space Launch Complex-8 here Tuesday, April 20, 2010. The launch time frame is from noon to 5 p.m. The Minotaur IV will launch the Defense Advanced Research Projects Agency's Falcon Hypersonic Technology Vehicle 2. The Falcon HTV-2 will fly a hypersonic glide trajectory within the earth's atmosphere to a broad-ocean area impact point near the Reagan Test Site in the Kwajalein Atoll, Republic of the Marshall Islands. DARPA's Falcon HTV-2 program seeks to demonstrate advances in high lift-to-drag aerodynamics; high-temperature materials; thermal protection systems; and advanced guidance, navigation and control. The Minotaur IV Launch Vehicle is the newest variant in the Minotaur family of rockets built by Orbital Sciences Corporation. The Minotaur IV is a four-stage solid rocket vehicle consisting of three decommissioned Peacekeeper missile stages and a fourth, commercially-built stage developed by OSC. The rocket is designed to place a payload weighing up to 1,735 kilograms into low-Earth orbit. 30th Space Wing commander Col. David Buck is the launch decision authority. 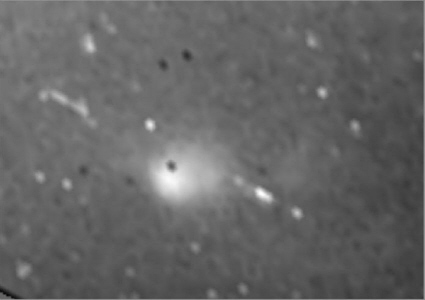 (MAR 29) On the night of April 5-6, anyone in a path extending from the Los Angeles area to Edmonton, Alberta has a chance to see Zeta Ophiuchi, a naked-eye star, suddenly vanish and abruptly reappear several seconds later as the asteroid 824 Anastasia passes in front of it. The International Occultation Timing Association (IOTA) wants as many observers as possible to watch this event and time its length by counting or recording it with a camcorder. Anyone with the most rudimentary knowledge of the sky can help map the outline of Anastasia. The detail of the measured shape will be proportional to the number of locations from which it is observed. For more information, go to http://www.asteroidoccultation.com/observations/NA/Anastasia/. 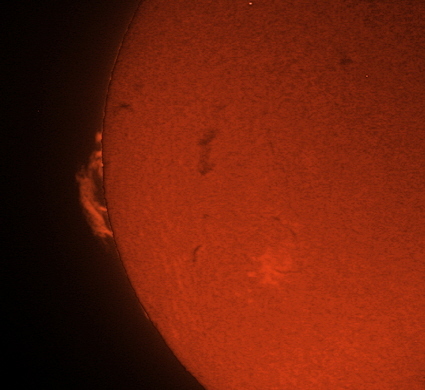 A large solar prominence hovering above the Sun's limb on March 17 provided further evidence that the Sun was emerging from an extended sleep. 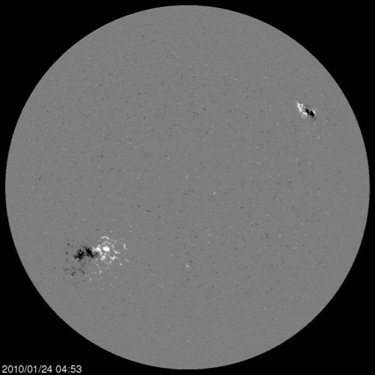 Solar imager John Boyd captured the event at approximately 20:00 UTC from Santa Barbara, Calif. Boyd combined two different exposures from a Canon G2 camera attached to a Coronado Solarmax 40 H-alpha telescope to create this composite. Image Copyright 2010, John Boyd. Used with permission. (MAR 13) Hawthorne, California-based SpaceX Corporation has successfully test fired the inaugural Falcon 9 launch vehicle at Cape Canaveral. According to SpaceX "Following a nominal terminal countdown, the launch sequencer commanded ignition of all 9 Merlin first stage engines for a period of 3.5 seconds." Just prior to engine ignition, the pad water deluge system was activated providing acoustic suppression to keep vibration levels within acceptable limits. The test validated the launch pad propellant and pneumatic systems as well as the ground and flight control software that controls pad and launch vehicle configurations. The completion of a successful static fire is the latest milestone on the path to first flight of the Falcon 9 "
The Falcon 9 is a two stage, liquid propellant launch vehicle. The inaugural Falcon 9 launch will place a qualification unit for the Dragon reusable spacecraft into orbit. (MAR 3) PASADENA, Calif. -- NASA's newest Mars orbiter, completing its fourth year at the Red Planet next week, has just passed a data-volume milestone unimaginable a generation ago and still difficult to fathom: 100 terabits. (FEB 15) UPHAM, NM - The first batch of concrete was poured Thursday, February 11, marking the start of the final concrete finish phase of the runway construction at Spaceport America, the world's first purposebuilt commercial spaceport. The runway project, which began in August 2009, is expected to be completed this summer, according to the New Mexico Spaceport Authority (NMSA). Measuring 10,000 feet long by 200 feet wide, the runway is designed to support nearly every aircraft in the world, as well as the day-to-day space tourism and payload launch operations like those for Virgin Galactic's WhiteKnightTwo and SpaceShipTwo. The large concrete runway will accommodate returning launch vehicles, fly-back rocket boosters and other space launch and training vehicles. 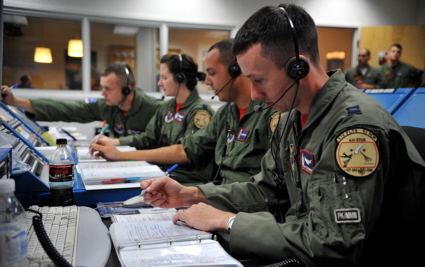 The airfield lies strategically within the White Sands Missile Range restricted airspace call-up area, which provides a unique opportunity for customers to fly in either the national airspace system or full restricted zone, depending on the mission requirements. David Montoya Construction, Inc., of Alameda, NM, is building the airfield at Spaceport America. A Ground-based Interceptor (GBI) lifts-off from Vandenberg Air Force Base on January 31. The GBI was launched in an attempt to intercept a mock warhead launched aboard a target missile from the central Pacific. However, the radar used for tracking during the test malfunctioned, and an intercept did not occur. Image Copyright 2010, Brian Webb. All rights reserved. (JAN 31) VANDENBERG AIR FORCE BASE, Calif. -- The Missile Defense Agency conducted a flight test today of the Ground-Based Midcourse Defense System. A target missile was successfully launched at approximately 3:40 p.m. PST from the U.S. Army's Reagan Test Site at Kwajalein Atoll in the Republic of the Marshall Islands. Approximately six minutes later, a Ground-Based Interceptor was successfully launched from Vandenberg Air Force Base, Calif. Both the target missile and Ground-Based Interceptor performed nominally after launch. However, the Sea-Based X-band radar did not perform as expected. Program officials will conduct an extensive investigation to determine the cause of the failure to intercept. (JAN 15) U.S. Air Force Academy cadets successfully test-fired a solid-fuel rocket propulsion system in Colorado on Friday. The FalconLaunch-8 system produced 3,300 pounds of thrust and burned for 10 seconds. The propulsion system was developed for FalconLaunch-8, a rocket slated for launch from White Sands, New Mexico in April. Copyright © 2010-2011, Brian Webb. All rights reserved.